As the calendar flips to yet another new year, we’re itching to get back out onto the Kenai River here at All Alaska Outdoors Lodge. It feels like ages since we reeled in that last feisty silver salmon of the season. It may seem like light years away, but there’s no better time than right now to book an overdue Alaska fishing expedition to the Kenai Peninsula. Reservations for next summer are already booking fast – don’t get left out of the action! Our deluxe Alaska fishing packages make us one of the premier fishing lodges along the Kenai River. Our five fly fishing trips are the main draw here on the outskirts of Soldotna, Alaska. We’re one of the only Alaska fly fishing lodges to offer wellness weeks (with Dr. Bob Ledda), ptarmigan hunting, bear viewing, and world-class salmon fishing. Keep reading to learn more about our five world-class fly fishing trips. Your group of eager anglers will start near the breathtaking, snow-capped mountains surrounding Kenai Lake. The drift boat will float down the turquoise Kenai River in search of ten-pound rainbow trout, beautiful Dolly Varden, feisty silvers, and crimson sockeye salmon. You might also journey through the majestic Skilak Lake on your upper Kenai River expedition. The “Upper Kenai” is one of our most popular trips to include in our Alaska fishing packages. Speaking of incredible Alaska fishing packages, the “Ultimate Expedition Alaska Fly In” is an excursion you’ll never forget. Your group will fly into remote areas near Lake Clark National Park or Kenai Fjords National Park, two of the most beautiful preserves in the world. You’ll spot mountains, volcanoes, glaciers, and flourishing wildlife. We don’t want to give away our secret locales, but you’ll be landing in the pristine waters of rivers and lakes full of migrating salmon, lake trout, northern pike, and many more species. Most Alaska fishing lodges don’t have flightseeing planes quite like our “Super Cub,” which can access the most remote bear-viewing and fishing locales in Alaska. The “One-On-One” excursion features some of the best rainbow trout and silver salmon fishing in Alaska. Reel in over 100 graylings, visit the Alaskan “Bay of Pigs” for monster silver salmon or throw a line into the Bachata River – it’s entirely up to you! This full-day fly fishing trip runs in August and September along the west of side of Cook Inlet. We’ve hand-selected many rewarding streams that can only be accessed by wheeled planes. The three most common fish on this journey include Arctic char, chum salmon, and those feisty silvers. We occasionally spot wild brown bears on these excursions. The water is crystal clear, and there are sight-fishing opportunities abound. Very few Alaska fishing packages utilize the gorgeous Russian River because it doesn’t have any king or silver salmon. 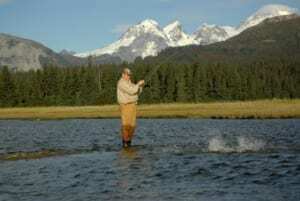 But you’ll have plenty of action from sockeye salmon, rainbow trout, and some Dolly Varden. It’s one of the only Alaska fishing trips that run through the very boundary between the Kenai National Wildlife Refuge and the Chugach National Forest, a beautiful wilderness where moose, brown bears, elk, and porcupines room the Earth. Give us a call today at 1-907-953-0186 to book an overdue fishing trip to Soldotna, Alaska!